Antigua’s coat of arms is a sunny gathering of the island’s signature elements—sea, sugar, wildlife—and perched on top like a glistening crown is the black pineapple, which is said to be the world’s sweetest. 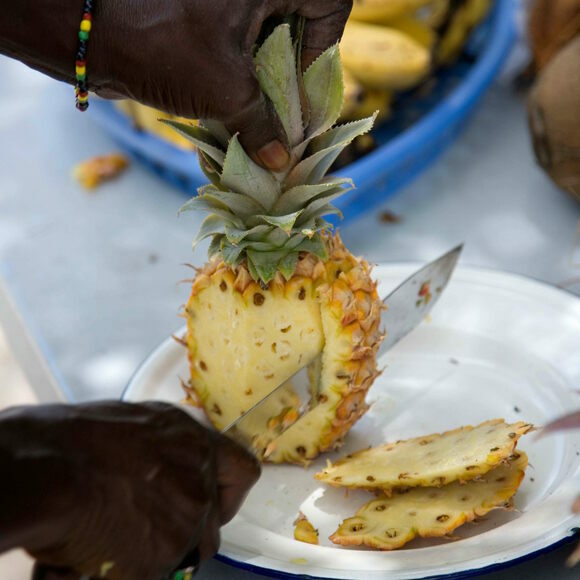 Brought to Antigua from South America by the Arawak people, the pineapple was first cultivated in the 17th century on the island’s southern coast. Since then, not a lot has changed. Black pineapples still grow on small southern farms, almost exclusively for local consumption, with a regard for quality over quantity in all respects. Production is so modest, in fact, that many restaurants and resorts import their pineapples (from places such as Florida) in order to stock enough fruit for their guests. Crispy and sugary sweet without being acidic, black pineapples are delectable to the core. Despite their name, the fruit is never black. The skin remains green even when ripe, so picking the perfect one relies heavily on smell and touch. Local farmers say the island’s rich soil, moderate rainfall, and copious sunshine create an ideal growing climate that, while others may try, cannot be replicated elsewhere in the world. Roadside stalls selling Antigua black pineapples are sprinkled throughout the island, but for the best variety head south to an area called Old Road. These natural cocktail stirrers sprout from the Caribbean swizzlestick tree. If you can get past the foot odor, its pulp is great in smoothies. Fruit soaks in rum for up to a year to make this rich Caribbean Christmas cake.